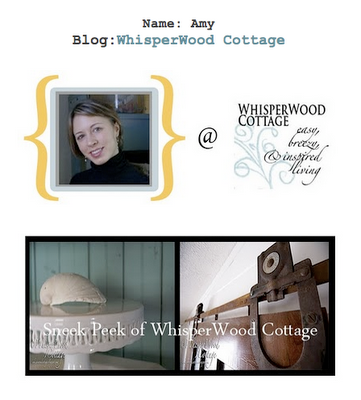 WhisperWood Cottage: So You Think You Can Decorate? Apparently I do. So You Think You Can Decorate? Apparently I do. So you think you can decorate? Apparently I think I can! Enough to say yes to the invitation to join blogland's newest venture....the "So You Think You Can Decorate?" competition. When Stephanie@Alchemy Junk emailed me to join the cast of 10 designers who will be completing 10 challenges in 10 weeks, I was honored to be included. They've posted teasers about 5 of the competitors so far. Now that I've seen some of my competition, I have moved from the initial wow-don't-I-feel-cool stage to the what-have-I-gotten-myself-into stage. Seriously. Here are some clues to 4 of the other 9 competitors: thrifty, funky, feminism, and mustard. Curious? Check them out here! The competition will begin on February 28th. So after that point, I hope you will be seeing a lot of this button at the right. If you don't see it every week, that means I got kicked to the curb! Oh? Didn't I mention that the person with the lowest votes each week will get eliminated!? YOU get to vote each week for your favorite!! You choose who stays in the contest....and who goes. Are you feeling the power trip yet? No matter what, it will be a fun time to see lots of projects, get involved in the action, and even win giveaways! If you want to sponsor prizes/giveaways, they have opportunities to get involved. Check it out! So, do I think I can decorate? I guess we're going to find out! Here goes nothin'! Hey, this sounds like a blast!!! Can't wait till I get to cast my vote. :-) How fun. Best of luck to you! You'll be in it to the end...I'm sure. WooHoo!! I KNOW you can decorate, Amy. I have my voting click finger aimed and ready. Those others don't stand a chance!! You can count on my votes!!!! There isn't a doubt in my mind about your talents. I'm ready and positioned to click...just tell me when! BTW, I am so stealing, I mean borrowing that photo for a post I'm getting ready to do...just so you know! Amy this is so cool! I can't wait to see what you all come up with. I know you'll go far girl! Good luck!! I am so excited for this--congrats, what fun you will have! AMy, it's gonna be fun, glad to be a part of it too, we've got some talented girls! You go girl. So excited for you. You will do AWESOME!! Congratulations!!! I am sure you will do wonderful!!! You have so many amazing ideas. Enjoy it!! I think that you may be a little nervous but it will be fun. Go, Amy, go! You'll be fab! Good Luck Amy... you've got some stiff competition so far... but you'll do great... Talkin Trash Deb will be talkin some serious trash in your favor in the coming weeks... and I'll be listening!